A finalist for the National Book Award, Don DeLillo’s most powerful and riveting novel—“a great American novel, a masterpiece, a thrilling page-turner” (San Francisco Chronicle)—Underworld is about the second half of the twentieth century in America and about two people, an artist and an executive, whose lives intertwine in New York in the fifties and again in the nineties. With cameo appearances by Lenny Bruce, J. Edgar Hoover, Bobby Thompson, Frank Sinatra, Jackie Gleason and Toots Shor, “this is DeLillo’s most affecting novel…a dazzling, phosphorescent work of art” (Michiko Kakutani, The New York Times). "There's pleasure on evey page of this pitch-perfect evocation of a half-century." "Underworld is a page-turner and a masterwork, a sublime novel and a delight to read." "Masterpieces teach you how to read them, and Underworld is no exception....Anastonishing piece of prose and a benchmark of twentieth-century fiction, Underworld is stunnigly beautiful in its generous humanity, locating the true power of history not in tyranny, collective political movements of history books, but inside each of us." 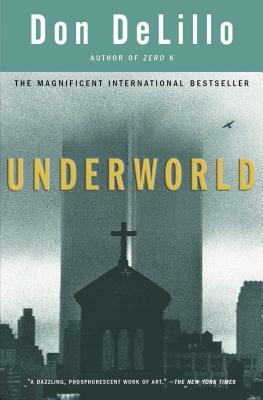 Underworld is a “dazzling and prescient novel…A decade after 9/11, it’s worth rereading Don DeLillo’s 1997 masterpiece to appreciate how uncannily the author not only captured the surreal weirdness of life in the second half of the 20th century but also anticipated America’s lurch into the terror and exigencies of the new millennium...A breathtaking set piece…the prologue is a bravura display of Mr. DeLillo's literary powers." "Underworld is magnificent book by an American master." "The book is an aria and a wolf-whistle of our half century. It contains multitudes."